October News for Golden Gate Bridge Furniture Co.
Is the Holiday Season really just around the corner? Time has just been flying by. In the year since we have launched this blog, we have been busy creating new designs to add to our catalog, establishing a social media presence, and marketing our product through trade show and gallery venues. It has been a productive and exciting ride, and we look forward to what the next season will bring us. Before we realize it, another year will have sped by and we will be ringing in the New Year! 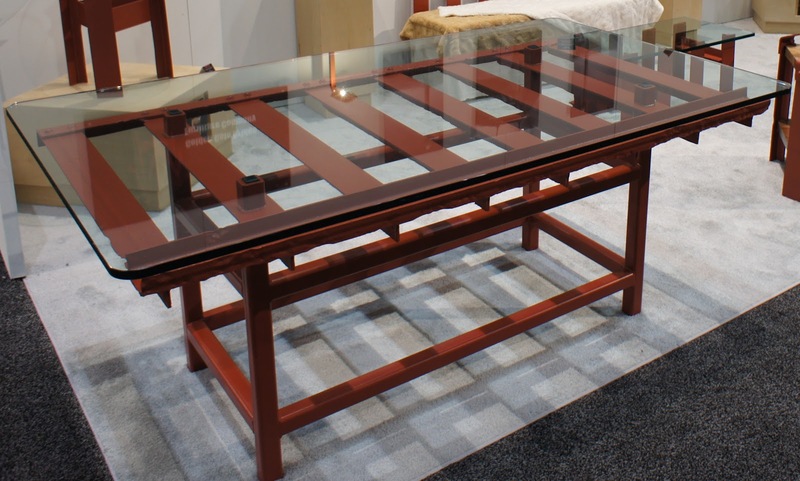 The two most recently introduced designs are our new Conference Table and Executive Desk, which made their debut at the 2012 Dwell OnDesign show this past June. 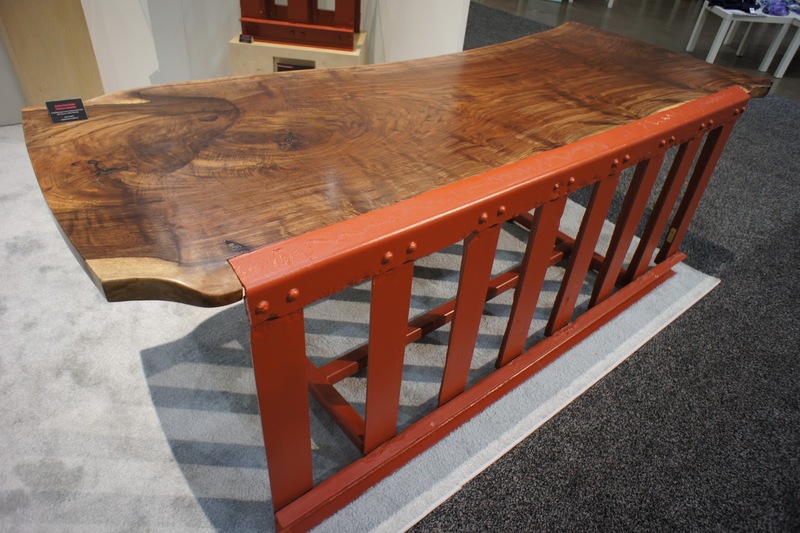 The Conference Table takes a section of original Golden Gate Bridge handrail and lays it across a cage table base crafted of new American sourced steel. A glass table top showcases the section of handrail beneath it. The Executive Desk utilizes a section of original Golden Gate Bridge handrail along the front side of the desk. The desk top is crafted from locally sourced native species wood. 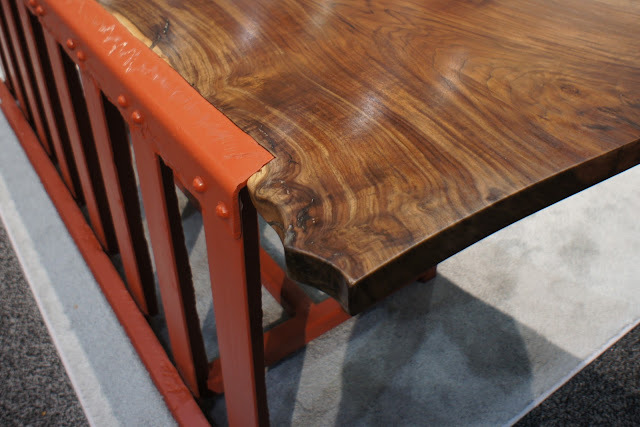 Edition #1 (shown above), which was showcased in our 2012 DOD booth, incorporated a large slab of Claro Walnut displaying a beautiful graft line where an English Walnut was grafted onto the root stock of the native California Walnut. This was a practice commonly done in local area orchards. The native walnut tree fared better in the California climate, but the English Walnut had a higher nut yield and a thinner shell, so it would be grafted onto the native tree, thus extending its life. The resulting wood near the graft line, with its beautiful, variegated marble-like swirls, was what was then originally referred to as Claro Walnut. Shown here in this detail shot of the Executive Desk, the desktop is given a live edge, maintaining the flow of the grain, before it blends in to the edge of the handrail. Join us in the conversation by following us online at one of our social media venues. You can find us at Facebook, Twitter, Pinterest, Tumblr, Flickr, and LinkedIn. Whichever venue you’re active at, we invite you to come follow us to find out what is new and what inspires us. With the holidays and the New Year just around the corner, keep an eye out for some new designs we hope to debut in the upcoming months.